One of my all time favorite genres (that I keep forgetting that I love THIS much, until I read one!). LOL! A perfect mix between “they absolutely hate each other” and potential “office romance” and this one had me grinning from ear to ear by the time I hit the end. 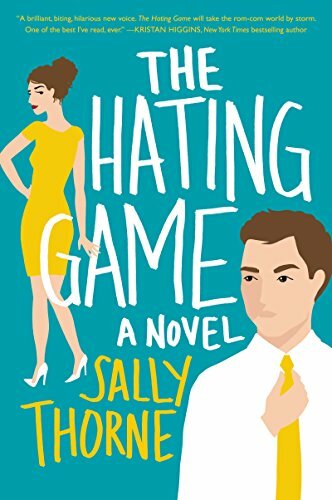 It was just a fun, well-written comedy romance that had me laughing heartily, while still feeling all the good stuff that goes with a somewhat slow burn romance book. Nothing too angsty, although maybe the near-end shebang was a bit over the top (and risky!) but still, I REALLY loved these characters! And to make it even more fun for me? It’s told COMPLETELY from her POV and I LOVE THAT!!!!! I could totally immerse myself. Become her and worry and stress and balk with her. And swoon and wonder and hope, with her. Lucy and Joshua both work together (literally desk-to-desk – one across from the other) in a publishing company. Grudgingly. They both wish the other would disappear. I’m twenty-eight years old and it seems I’ve fallen through the cracks of heaven and hell into purgatory. A kindergarten classroom. An asylum. In fact it’s TWO publishing companies that merged into one, and both sets of employees that merged with it are sort of… on “sides” (even though they’re all working for the same team now). But the two biggest corporate enemies are none other than our two main characters, and it is well known through the entire office, that these two are like oil and vinegar. I made a mistake when I first met Joshua: I smiled at him. My best sunny smile with all my teeth, my eyes sparkling with stupid optimism that the business merger wasn’t the worst thing to ever happen to me. His eyes scanned me from the top of my head to the soles of my shoes I’m only five feet tall so it didn’t take long. Then he looked away out the window. He did not smile back, and somehow I feel like he’s been carrying my smile around in his breast pocket ever since. He’s one up. After our initial poor start, it only took a few weeks for us to succumb to our mutual hostility. Like water dripping into a bathtub, eventually in began to overflow. Hilarious dialogue (and even funnier internal musings) lead the way for a good half of the book. I absolutely reveled in that! He sits up straighter but the corner of his mouth moves. I wish I could use my thumbs to pull his mouth into a huge deranged grin. As the police drag me off in handcuffs I’ll be screeching, Smile goddamn you. We need to get even because it’s not fair. He’s gotten one of my smiles, and seen me smile at countless other people. I have never seen him smile, nor have I seen his face look anything but blank, bored, surly, suspicious, watchful, resentful. Occasionally he has another look on his face, after we’ve been arguing. His Serial Killer expression. The familiar bubble forms in my head. I wish he was my friend. I burst it with a pin. … and it’s THAT, that had the butterflies swirling in my belly. Gah. I LOVE HIS NICKNAME FOR HER!!!!!!! Or sure, at first… it’s somewhat condescending, but omg did it make me grin and swoon at one point. “Poor Shortcake,” he says in my ear. Plus, it’s the excellent reason for the sort of… “truce” that had these two functioning together on a different level that had me giggling like mad! Oh, well. He’s seen and heard almost everything now. There’s nothing left to do but fake my own death and start a new life. And suddenly, these two had no clue what to do with each other anymore. While I would have loved more hilariously hateful interactions between the two (fantastic dynamic that had me HOOKED), it did transition slowly enough for us to believe the story’s progression, and the character growth. I would have also loved the addictive intensity from the first half of the book to continue throughout the whole story. The second half was a bit more… relaxed (which is great for many, but you know me… I love to be reading with my emotions all over the place, which the first half of the book ABSOLUTELY did to me). But overall, nothing too angsty, nothing too tragic, nothing eye-rolling. Just a fun office romance read, with characters that start off just the way I love ’em. Full of animosity. LOL!!! And that’s where I’ll end this. It’s an easy, fun and sweet read with amusing hijinks, and witty (albeit spiteful) banter, but there’s just more to the story to explain where (and why) all that came from. Good stuff! Thanks to bev for recommending this one to me. It was EXACTLY what I needed. P.S. I just loved the character descriptions, especially that of the heroine. I totally bonded with her and her tinyness! LOL!! P.P.S. Thank you to the publisher for sending me a review copy of this book. Not sure how I feel about it being $10 for a debut author…..
I’m glad you had fun with it Maryse. I knew you would want more of the first part, lol. In a way I did too. More of the slow burn, but with a bit of the edges sanded. I love the paint ball scenes and wish for that time to be expanded more, more of those types of days. This book has three things that I wish other books would do more often. Chemistry between the characters, good dialogue, and a relationship progression whether from enemies or friends or strangers to whatever they are at the end. Basically I just smiled through the whole thing. And did think of all my short friends on here. Not twins but reminded me of why I like Act Like It so much, it hit those three points too. I want it to go on sale! Also All the Ugly and Wonder Things. Lisa!! I want to read All the Ugly and Wonderful Things too!! BADLY! It’s steep for a first time author. Also, I think we are loyal readers and once hooked will, often, follow our authors to hard back prices. Especially if they only release one a year. All the Ugly and Wonderful Things is one of the best books I’ve ever read and I’ve been reading for many years 😉 I borrowed it from a friend because it’s a little to pricey for my book budget.